My Bright Firefly: 9-11. A Day of Heroes. Can you think of any true heroes living next door? I found a few who never were awarded medals or featured in media. They are TRUE HEROES and I want to write about them here on this day of 9-11. I want to send my huge thanks to all the military wives out there! Your everyday activities and bearing are the main base and support for all our safety and security. Thank you all so much! I'd love to mention Rachel, a mother of 3 and a Marine Corps wife. She uses a dash of pixie dust to make it through her day and writes at Adventures in Wunderland when she has a free minute. She created a graphic you can see below. "The only thing I will be posting tomorrow is the words "Never Forget" across all platforms....as a military wife and especially as terrorist threats are being raise and the state of the Middle East right now," she said. Also, please, read this story that stroke me today. 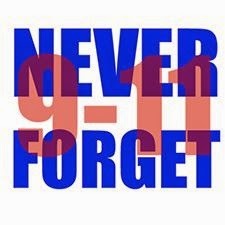 Most of us remember the date 9/11/2001, and exactly where we were and what we were doing when we heard of the tragedy in New York City, Washington D.C. and a field in Pennsylvania. We must long remember the Heroes in those places. Like the Heroes from the Alamo, Pearl Harbor, and the beaches of Normandy, the Heroes from that day have their page in history carved in granite. We all stayed for about two more hours, until the Governor shut down all State offices. The last elevator leaving the 38th floor going to the bottom contained the Bureau Chief, Tom who decided to stay anyway, Rob, and myself. Since that day, I have looked on Rob in a different way, because he became a hero to me that day, putting others safety in front of his fear. After we left the building and went home, like all American’s, as well as most of the rest of the people in the world, our shock at what had happened turned into grief. Then as we learned more of what really happened, that grief turned extreme pride in our heroes, as well as in our Country. So on this day, and every day, let us come together as a Country, remember those heroes, and let us always work hard to make them proud of us who are left behind. Do you have a story to share today? I'd love to read it!